Balinese people are very religious and they regularly hold ceremonies and parades in their communities. They bring offerings to the Gods in order to ask for their good will and to appease them. Wira, the general manager at Jiwa Damai, invited us to join his familiy in one of the bigger ceremonies held in his village. We, the foreigners, got dressed up in traditional Balinses clothes. Everyone is wearing a sarong. This is really the essential piece of clothing you need during your stay on Bali! The festivities started with a ceremony in the local temple. Afterwards all the people of the village set out to march to the next village, to the next temple to hold the religious ceremony there. The whole march took about 6 hours in the hot Balinese midday sun! The group stopped at 4 different temples to hold ceremonies. It was quite a challenge to walk in the boiling heat for that many hours and for so many kilometers. But it was a very special and rewarding experience at the same time. We, the foreigners, or the "bule" (how the Balinese people call foreigners) were the attraction of the group. Everyone eyed us carefully & curiously... but they welcomed us in the group with warm feelings. The Balinese women were all dressed in their most beautiful clothes, carrying basket with offerings on their heads. And the little kids were absolutely adorable ! All in all this day was a great experience! At Jiwa Damai we offer our guests the opportunity to get in close contact with the Balinese people and to take part in ceremonies and local festivities. To inquire about upcoming festivities and the possibility to join, write us an email> info@jiwadamai.net. One of the many activities you can take part in while visiting Jiwa Damai is being a guest at a local dance class for children right here in our local village! Our guests and wwoofers enjoy watching the talented children learn and perform traditional Balinese dance. Because the dance is beautiful and unique one of our volonteers inquired about a private lesson with the local dance teacher. What a special experience! She was so lucky to have this lesson because she was getting a genuine traditional dance class. She loved it so much she has been continuing her classes! This type of traditional dance is not as easy as it looks! The low squat and many intricate movements make this dance very beautiful and also very hard to learn in just one lesson! New movements are introduced such as eye direction, winks, hand twirls, and hip sways! Once you start its hard to stop! The gracious dance teacher enjoys it very much as well as having visitors to her class in the village. Hello, I am Julia from New Zealand. 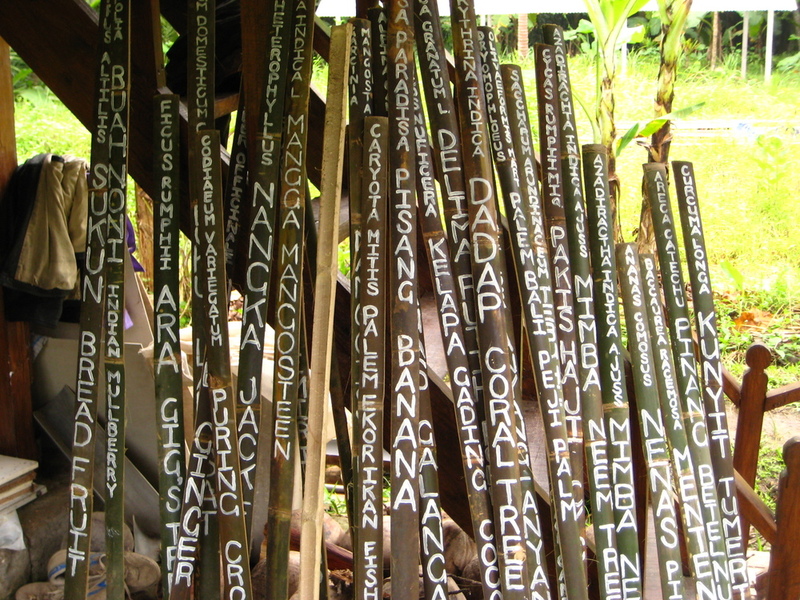 One of the jobs I had here at Jiwa Damai was to write the labels for the ceremonial garden. Everything for the garden is labelled in Latin, Indonesian and English so I got to learn a lot about the different plants, and Ketut Badung taught me lots about what the different plants are used for which was super interesting!